Plants perennial, glabrous. Stems prostrate, forming mats to 2 m diam., branched; rooting at nodes. Leaves: petiole ± absent; blade oblanceolate to elliptic-ovate, to 6 × 2.5 cm, tapered to clasping base. Inflorescences: flowers solitary; pedicel to 20 mm. Flowers: calyx lobes pink-purple adaxially, with subapical abaxial appendages, ovate to lanceolate, 3-10 mm; stamens 30; pistil 5-carpellate; ovary 5-loculed; styles 5. Capsules conic, 10 mm. Seeds 30-60, black, 1.2-1.5 mm, shiny, smooth. Flowering year-round. Wet or desiccated soils, beaches, dunes, margins of coastal wetlands, waste grounds, ballast; 0-5 m; Ala., Fla., Ga., La., Miss., N.C., Pa., S.C., Tex. ; Mexico; South America; Europe; Africa. Sesuvium portulacastrum is a widespread and variable subtropical and tropical species to which many names have been applied, particularly to material collected beyond North America (e.g., Argentina and Brazil). Although S. portulacastrum occurs or has been reported in natural habitats on the east coast of North America north to North Carolina, and from ballast north to the Delaware River in Pennsylvania, there are no verified records for this species occurring in western North America north of Mexico, where it occurs northward along the coasts of Sonora and Baja California. 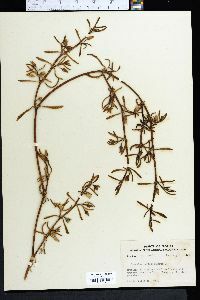 All records or collections of S. portulacastrum from desert wetlands of the United States are included in S. verrucosum.